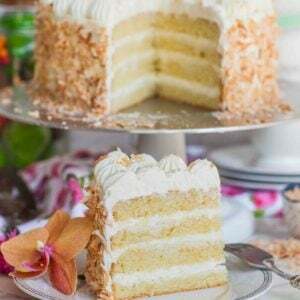 The perfect dessert for spring, summer and any holidays in between! 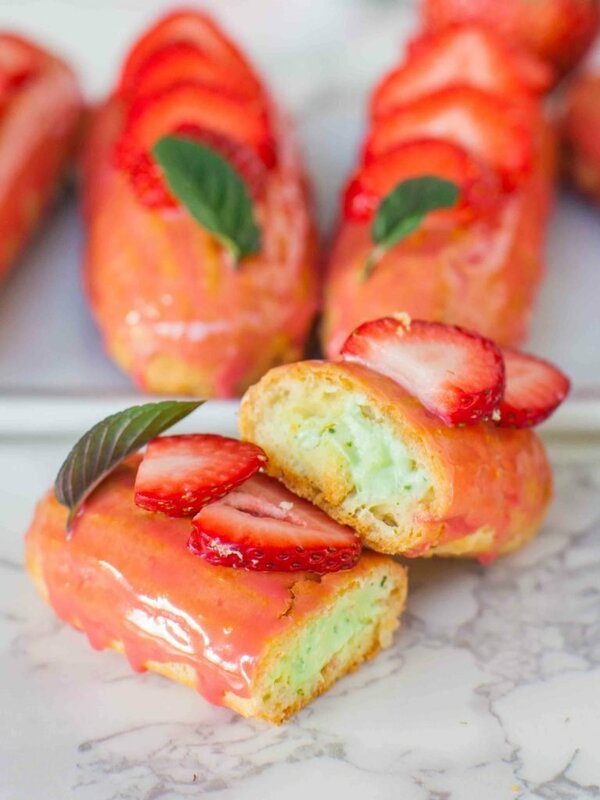 These strawberry basil eclairs are simply amazing! If you’ve never had a strawberry basil dessert, this recipe will blow your mind! 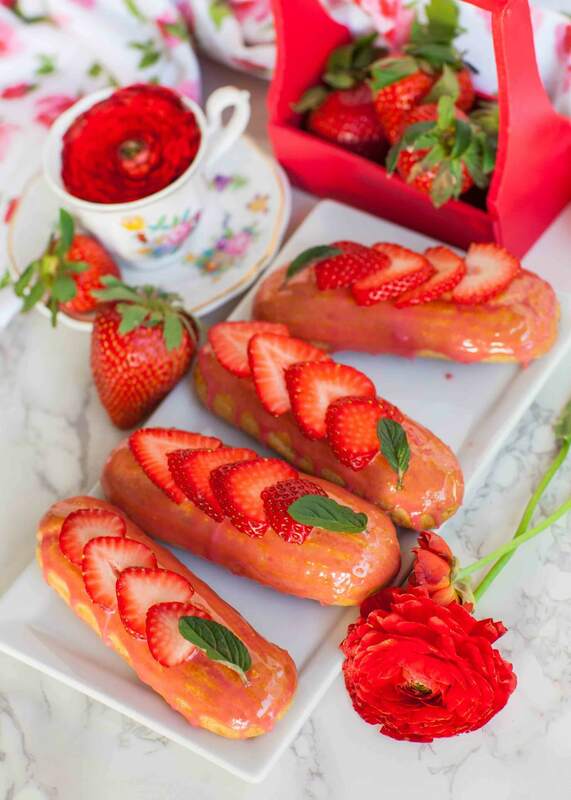 These eclairs are filled with a light and fluffy basil whipped cream, dipped in white chocolate ganache and topped with fresh sliced strawberries! Watch my video for step-by-step instructions! 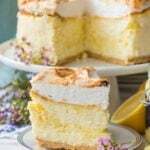 Want to receive new recipe updates? 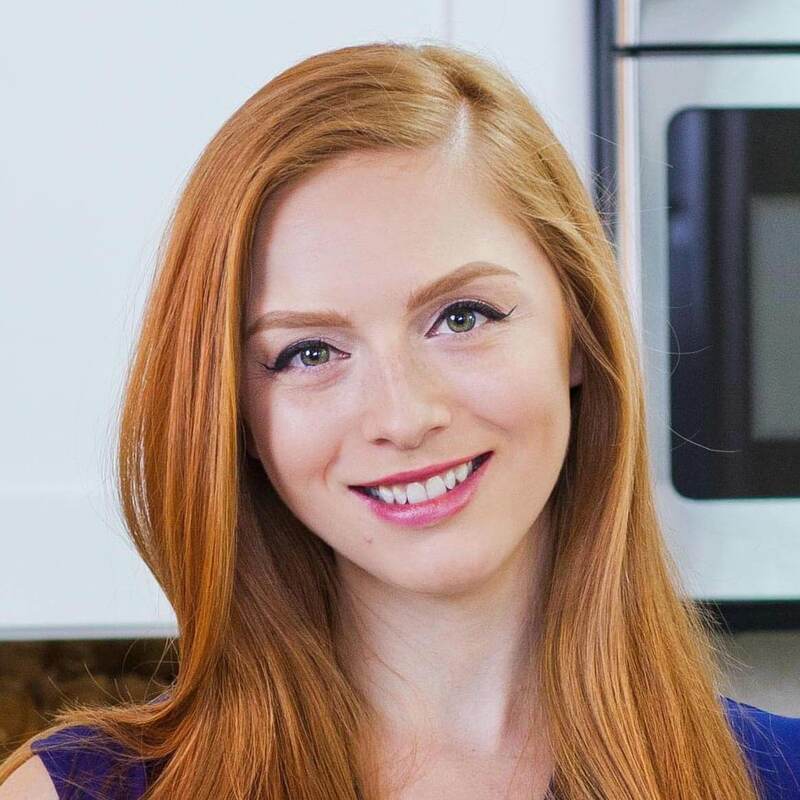 Make sure to subscribe to my YouTube channel and get email notifications whenever a new recipe goes live! 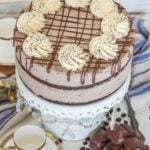 This dessert is not only pretty, it’s also so fun to make! Eclairs may look intimidating but they’re actually quite simple to make. I use a simple pate a choux recipe, then add the filling and topping. 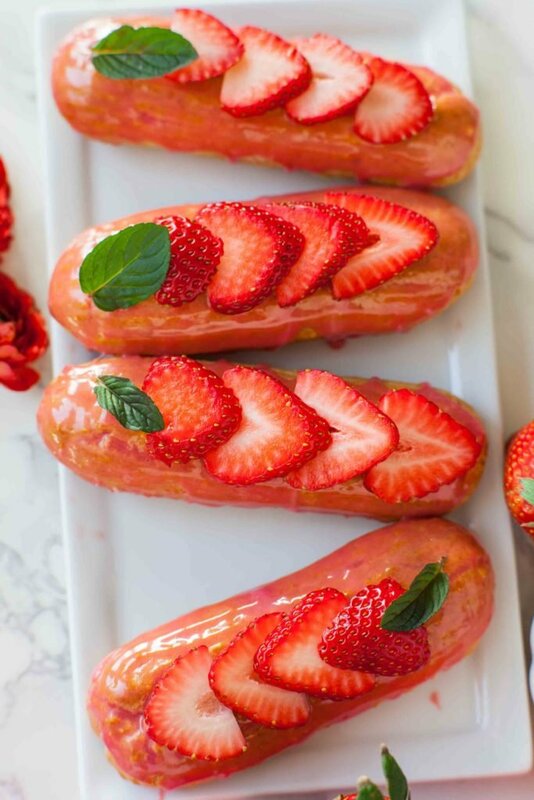 For the strawberry component, I add fresh strawberries right on top of the eclairs. I recommend doing it right before serving the eclairs so that the berries stay fresh. Once you have the eclairs assembled and glazed, keep them stored in the refrigerator, single layer on a tray, until you’re ready to garnish and serve. You’ll need just 5 ingredients for the eclair shells; pate a choux dough – eggs, water, flour, butter and a pinch of salt! Here are a few tips for making pate a choux successfully! Check out the fluffy basil filling on the inside! 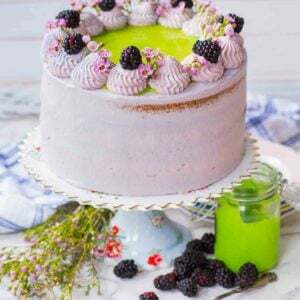 The basil whipped cream filling is heavenly! It’s made with a fresh bundle of basil, cream cheese (you can use mascarpone) and white chocolate. This choice as an eclair filling goes so well with the strawberries on top! 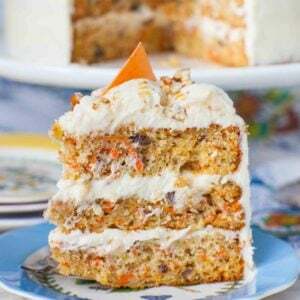 This filling would taste delicious in a cake, too! 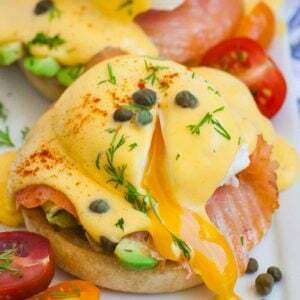 Enjoyed this recipe? Please share it on Pinterest! I have plenty of options! These ‘Coffee Chocolate Eclairs’ are one of my favorites! And one of my other favorites, these ‘Raspberry Pistachio Eclairs’ are fruity and delicious! Use this simple but handy handheld KitchenAid mixer to prepare the batter. I love my classic CuisinArt food processor – it’s amazing! 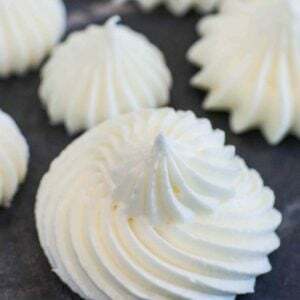 Any baker will love this set of jumbo cake decorating tips – good for piping and decorating. And these silicone mats are great for just about anything, along with these aluminum baking pans. Preheat the oven to 425F/218C. Line one or two large baking sheets with parchment paper or silicon mats. Prepare a large pastry bag with a French star tip such as 8FT. Prepare the pate a choux dough first. Sift the flour into a large bowl and set aside. Into a small saucepan, add the butter, salt and water. Cook the mixture over medium-high heat until the butter is melted and comes to a simmer. Add the flour all at once and stir until the a dough ball forms, about 1 minute. Transfer the dough into a large mixing bowl and allow it cool until warm to touch, about 15 to 20 minutes. Once cooled, begin adding the eggs, one at a time. 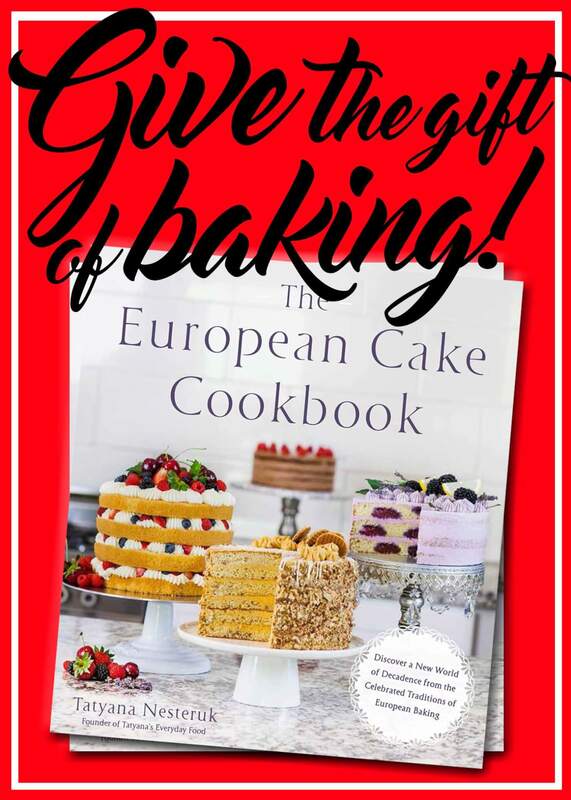 Use a hand-mixer or whisk to mix the egg into the dough after each addition. Transfer the dough into the prepared pastry bag, packing the dough into the bag without air pockets. Pipe 4 to 6-inch long eclairs onto the prepared parchment paper or silicone, spacing about an inch apart. Bake the eclairs in the preheated oven at 425F/218C for 10 minutes, then reduce oven temperature to 375F/190C and bake for an additional 35 to 40 minutes, until the eclairs are a deep golden brown. Avoid opening the oven door during baking - cold air will cause the eclairs to fall flat. Once they are baked, cool them completely on a wire rack. Prepare the basil filling. Place the basil leaves and confectioner's sugar into a food processor and pulse for about a minute until a smooth paste forms. Transfer the basil paste into a bowl with the softened cream cheese and white chocolate. Beat the ingredients together for a few minutes on high speed until smooth. In a separate bowl, whisk the chilled heavy cream for about 4 minutes on medium-high speed until medium peaks form. Add the basil and cream cheese mixture to the whipped cream and whisk again for about 1 minute, until stiff peaks form. To fill the eclairs, first use a filling tip, such as Wilton #230 to punch 3 small, evenly spaced holes into the bottom of each eclair. Transfer the filling into a pastry bag and pipe each eclair full of cream. Next, prepare the ganache. Combine the cream and white chocolate in a wide bowl. 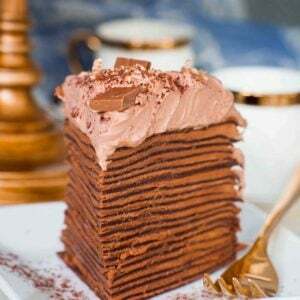 Heat in the microwave for about 1 1/2 minutes, stirring every 30 seconds, until the chocolate is melted and smooth. Allow the ganache to cool for about 10 minutes, until slightly thickened. Add the strawberry extract and a few drops of red food coloring and mix well. Dip each eclair into the ganache and let any excess glaze drip off before placing onto a cooling rack. Once eclairs are filled, keep them refrigerated single layer on a tray. When ready to serve, garnish with sliced strawberries and fresh mint or basil leaves. Eclairs will stay good for 3 days in the fridge. Hi Tatyana. 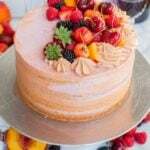 Thanks for inspiring me, I made your strawberry mouse cake, and it turned out pretty good. I couldn’t find the 8FT star tip anywhere, if you can let me know where to get it from, or what else I can use instead of that, it would be amazing. I did search on Amazon, the only place I found it was Alibaba. Got the one from the link you have me. Thank thug so much for the response.